Nassau County has constructed an emergency command center in Hicksville, that will facilitate emergency communications and operations. Bethpage, NY - August 22, 2018 - With the sixth anniversary of Superstorm Sandy approaching, Nassau County Executive Laura Curran today joined with Nassau County Office of Emergency Management Commissioner Steven Morelli and other Nassau County Public Safety and Emergency Response personnel to discuss important storm preparations and resources for residents. 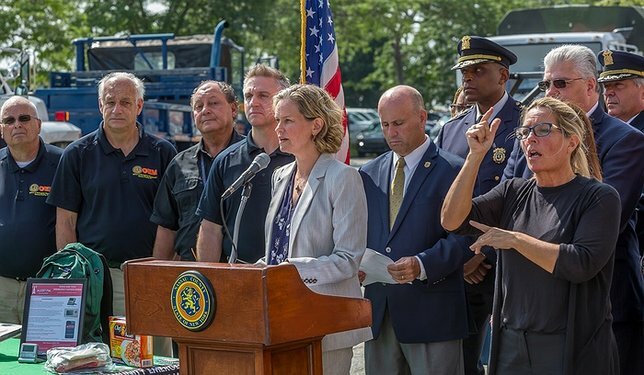 Subject: LongIsland.com - Your Name sent you Article details of "Curran Urges Preparedness As 6th Anniversary Of Superstorm Sandy Approaches"